Henrix, the American DJ and producer who we last featured for “Close Your Eyes” with Jakob Liedholm, returns to Mixmash Records for his latest release, Rock This Dream. Having risen from relative obscurity, the Miami native appropriately claimed the most played track at Ultra Music Festival this year with “Hit It!," a collaboration with GTA and Digital Lab from Size Records. 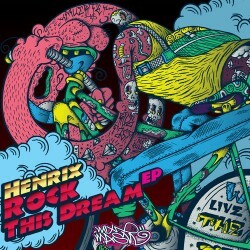 Henrix’s new EP continues the success we have come to expect, delivering a variety of sound with 3 diverse house tracks. The title track, “Rock This Dream," uses the spoken word vocals of Roland Clark to bring you up through the climb, then drops a beat much like that of Henrix’s track from last year, “Let’s Rave.” Contrasting this is another track with Jakob Liedholm, “Losing My Mind.” A true progressive anthem, a bright melody interlaces Gieuseppe Voila’s vocals to create an uplifting and hope-filled song. Finally, “Viral” straddles a line between the previous two: a lighter melody but with a massive drop whose chords remind me of the James Bond theme song for some reason. It really does keep getting better for this guy, who will be beginning touring with Bassjackers and Dyro this month on the Grid Tour. Buy tickets to select dates below, and check their Facebook’s for links to other shows. Inpetto remixes Helena Legend's "Pasilda"
Inpetto shares "How We Used To Do"
Digital Lab & Henrix team up on "Drop Low"